Silver Spring Stage presents On the Razzle by Tom Stoppard, directed by Erin Bone Steele and produced by Jim Robertson, a frantic farce of slapstick shenanigans, mistaken identities, unremitting display of puns, clever crossword puzzle tricks, sly sexual innuendos and romantic complications. As intellectually stimulating as Stoppard’s reputation, On the Razzle was never meant to more than a frolicking farce. It premiered in 1981 and was an instant hit in London. On the Razzle is a free adaptation of the 19th century farce by Johann Nestroy that before Stoppard inspired Thornton Wilder’s The Merchant of Yonkers, which led to The Matchmaker and the musical Hello, Dolly! He embellished the simple story of two naughty grocer’s assistants on an unexpected spree when their boss goes to woo a new wife with his trademark dazzle of verbal wit. 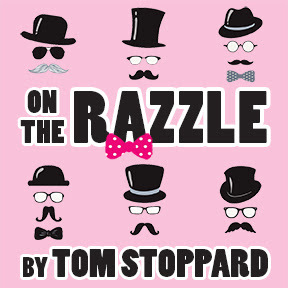 With On the Razzle, Stoppard becomes the prankster, complete with silly puns and double entendres. Yet, the play is not out of step with his other plays like Arcadia, Travesties, and Rosencrantz and Guildenstern are Dead. His very rewriting of the story reflects his theme of the changeability of time and characters’ adventures as the search of human identity. Stoppard said: “Theater is a pragmatic art form and in ways that are sometimes quite comical.” He changed a flaming pudding in the original Nestroy play to a birthday cake because of local theater fire laws. The title derives from a British description of someone about to drink a considerable amount of alcohol. On the Razzle will have audiences drunk with laughter. Herr Zangler (Roger Stone), a prosperous grocery store owner, plans to marry Mme. Knorr (Leta Hall), the proprietor of a women’s clothing shop in Vienna. In preparation for a new life in the big city, he orders a new wardrobe and hires the fast-talking Melchior (Stuart Fischer) as a personal assistant. He arranges to send his niece Marie (Micaela Mannix) to his sister-in-law in Vienna, Miss Blumenblatt (Virginia Swanson), to protect her from the penniless Sonders (Christopher Crockett) who is courting her. As he departs for Vienna, Zangler entrusts the operation of his business to his head clerk, Weinberl (Alex Batselos), and his naive apprentice, Christopher (Sarah Pfanz), who decide to go “on the razzle” or in search of an adventure to Vienna. Once there, Weinberl will become involved with the beautiful widow, Frau Fischer (Lorrie Smith Saito), and all the characters will wind up at the Imperial Gardens cafe for a clever swirl of hidden and mistaken identities. The cast also features Elizabeth Grace Colandene, Jacy D’Aiutolo, Ruth Diaz, Ken Kemp, Virginia Swanson, and Amanda Wesley. Audiences will not mistake the hilarity of On the Razzle. On the Razzle plays from May 29th to June 20, 2015 at Silver Spring Stage – 10145 Colesville Road, in Silver Spring, MD, in the Woodmoor Shopping Center. For tickets, call the box office at (301) 593-6036, or purchase them online. Performances are Friday and Saturday at 8:00 PM and matinees on Sundays June 7th and 14th at 2:00 PM. We have a Pay-What-You-Can Preview on Thursday May 28th at 8:00 PM. The Stage appreciates your contribution!